The process of molding and manufacturing plastic products through thermoforming allows for quite a few advantages over other possible techniques for shaping plastic parts. This form of producing plastics entails advantages that those working at all stages of the production process can appreciate, but in particular designers love thermoforming thanks to the flexibility, speed, and cost-effectiveness of the process. In thermoforming, heat is used to render a sheet of plastic more pliable so that it can be placed into a mold and acquire a desired form. 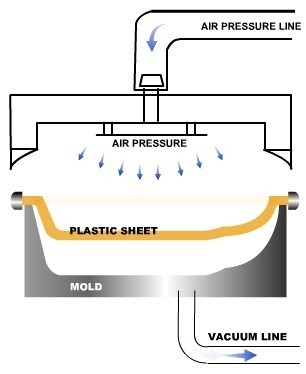 The process is typically discussed in comparison to injection molding, another possible method of molding plastic parts that involves injecting molten plastic into a mold. Both techniques for molding plastics became prominent manufacturing processes throughout the course of the 20th century as plastic products became increasingly ubiquitous. Yet thermoforming has made particularly notable advancements in recent years thanks to the attention it has received from its frequent application to new engineering technologies. Why do designers prefer this method of forming plastic parts? When designers and engineers have the process of thermoforming at their disposal, they enjoy a broader scope of possibility in terms of size and detail in manufacturing plastic products. They can rely on thin gauge thermoforming to create parts using sheets of less than 1.5 mm thick, and they can also create much larger parts that might require multicomponent assembly using other methods of plastic molding. This process also allows designers to select from a variety of different patterns, textures, and finishes. This plastic molding process also permits a prototype to be generated quickly and more easily than in injection molding so that production can begin as soon as possible. The process of creating a prototype using the thermoforming process results in greater precision because it allows actual finished parts of the same material as the finished product to be created before the project moves forward to the tooling stage. Thus, costly design and fit revisions are avoided early on before production tooling. Another advantage that simplifies the manufacture of plastic components is the flexibility of making enhancements to parts. Enhancements to a plastic part can often be made more easily and with less additional cost than they could be made by those resorting to injection molding. All of the advantages of thermoforming come together to offer one of the most important benefits provided by this manufacturing process: cost-effectiveness. Injection molding cannot compete with thermoforming in terms of the final costs of the processes for production runs of low volume part runs in most cases. In general, thermoforming project costs are sometimes as little as half the cost that they would be if injection molding had been utilized. Upon consideration, most designers and engineers recognize the superiority of the thermoforming process.